Have you ever rewarded yourself for a job well done? Maybe you bought your coffee instead of making it. Or you enjoyed a half-hour in the bathtub with no interruptions (or rubber ducks floating around next to you). Children need rewards too, especially during training, and a little reward can go a long way to make them feel special. Whatever your reward, it made you feel good, right? And it probably made you want to do more of the good job you’d done to earn it. That’s exactly how rewards work for potty trainees. Think about it: You’re a toddler, and you’re being asked to try an entirely new process that seems much harder than just peeing and pooping in your diaper like you’ve been doing for the past few years. As a result, the potty training process can feel overwhelming, tiring and even scary. So a little reward or two can go a long way in making potty training more fun. When potty training your kids, try giving them stickers that can be affixed to their shirts like little decorated generals. Some parents even let their kids affix the stickers right onto the potty. Others have rewarded potty training successes with candy pieces — one for number one and two for number two, of course. There are also parents who stocked up on cheap goodies from the dollar store to use as rewards; just make sure to avoid anything small that could potentially be a chocking hazard! The key to choosing a reward for your Potty Partner is to figure out what works with his or her personality. Others have skipped the treats altogether and used different methods, like helping their toddler fill out a potty training chart, singing and dancing, calling grandma, or simply offering up an enthusiastic high-five. The key to choosing a reward for your Potty Partner is to figure out what works with his or her personality, and to change it up if the reward stops working as an incentive. For instance, offer a different sheet of stickers every few days. 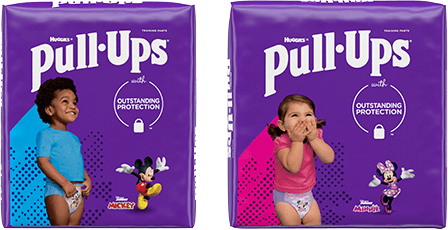 For moms and dads overseeing the potty training process, there are rewards as well. In a recent survey, 76% of moms agree that seeing their child’s pride at having success is a reward of potty training. Of course, a venti coffee, movies with your girlfriends or watching the game with the guys feels pretty good, too! While you’re potty training, reward your little one, and reward yourself, too. You’ve earned it!